What happened to Volaris at CLT? Volaris was supposed to start flying here on Thanksgiving, and then fly every Thursday and Sunday to Guadalajara. To my knowledge every flight to this day has canceled. I know AA is starting their own GDL service soon, maybe that’s why? 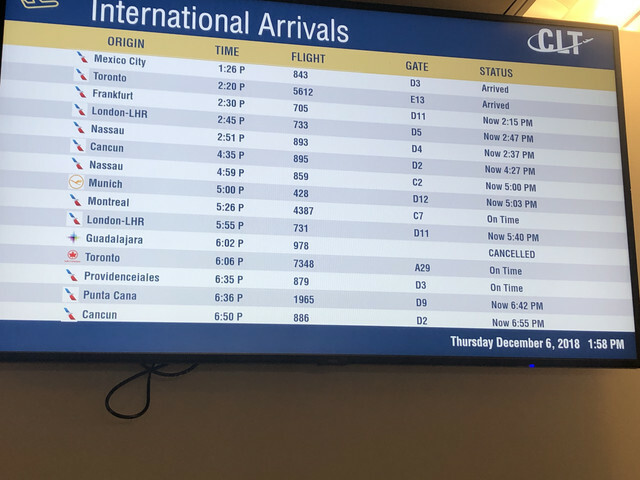 Re: What happened to Volaris at CLT? Wasn't this service starting in lieu of ABQ as well? Odd that CLT hasn't started burning fuel yet. Yea I think you are right. Yea. Weird. Maybe they hit off more then they could chew. First flight is December 13th per GDS. What happened to their first flight Y4 979 on the 13th? It left a couple hours late after arriving on time. Mechanical issue? That “first flight” was supposed to be on the 22nd of last month! We were all shocked when it showed up. No idea why it left so late. I know they were having a hard time translating how much fuel they wanted. Some Y4, and 4O crews really struggle with English, most are ICAO level 4 speakers. VB crews are even worse. AM and 5D crews tend to be better with English and as they require ICAO level 5-6 speakers. At larger stations like JFK and LAX, their outsourced ops and tech crews all are Spanish speaking. I was at their inaugural flight, seemed full and everyone was very excited! Unfortunately, as mentioned above, one of the flight attendants said that CLT was not prepared for the language barrier and/or the celebrations taking place. Seemed a bit odd, but atleast it made it! I work in the fueling side of the operation, and Volaris sent an instructor to teach us a class on how to fuel their planes. We weren’t exactly impressed with his professionalism. He didn’t know that A321s had auxiliary tanks, and when we asked about that he said that only AAs have Aux tanks because they were “old trash.” —even though Frontier flies in with A321s that are hardly 3 years old with Aux tanks. Anyway, nitpicking aside, I wish them the best. Very interesting. I’m surprised to hear about language problems. In my interactions with their staff, most (if not all) of the ground ops station staff are bilingual and Spanish isn’t exactly a rare language in much of the US. The flight crews do struggle with English at times and the FAs announcements in English can be nearly unintelligible; but, I would have thought the flight crew would be fluent enough to place a fuel order or get someone to help translate if there were questions. They fly lots of flights to the US and most of them train in the US after all. Thanks for the detail on the first flight. Who is doing their ground handling at CLT? I would think someone in ops would be calling the fueler with the amount needed. I think they originally had ViaAir doing their ground handling and when ViaAir disappeared they had to move to Jetstream who also handles F9. From what I've seen, there are limited bilingual speakers at Jetstream in CLT. I'm sure they are working on adding more, but they were kinds thrown the ground handling contract at the last minute. Above wing on the grooming side Jetstream has a few Spanish speakers amongst their staff (mostly from Central America). I have met a few when working into CLT. They can transfer a few to do below wing work and they can assist with the Volaris contract.